Registration begins Tuesday, February 5! For many of us the best part of membership is when we connect with each other. The 2019 Annual Meeting of Members and Educational Conference (EdCon) will provide ample opportunity to grow, learn, and connect with members across the country. EdCon will kick off with an amazing preconference tour in and around Madison. Stops will include the University of Madison Arboretum which features the Longenecker Horticultural Gardens and the Wisconsin Native Plant Garden designed by noted landscape architect Darrel Morrison. The tour will continue on to Madison’s most popular attraction, the Olbrich Botanical Gardens which offers over a dozen gardens including a sunken English style garden, rock garden, meadow garden, herb garden, and rose garden to name a few. After a day of touring area attractions meet up with friends and members at an outdoor reception at the University of Wisconsin–Madison’s Horticulture Department’s botanical garden known as the Allen Centennial Garden. After a day of touring, EdCon will kick off with the HSA Annual Meeting of Members where you will receive updates from the Board of Directors and have opportunities to take advantage of committee meetings to further catch up and connect with our mission and fellow members. Of course, EdCon wouldn’t be complete without a diverse range of speakers chartered with bringing you new and interesting ways to look at our useful plants as well as bringing fresh energy and ideas to topics we think we have already conquered. The youth and energy of Madison will set the tone and be our catalyst for making new connections and growth. Special HSA room rate starting at $159 (plus tax) a night. Information about how to reserve your room will be announced in January 2019. Stay Tuned! The Best Western Premier Park Hotel (Park Hotel) is the only hotel on Madison’s Capitol Square. From the hotel you will be able to step outside to dozens and dozens of locally owned restaurants within a short walk. For the shoppers among us Madison’s famous State Street is two blocks down with the beautiful Univ. of Wisconsin Madison campus just beyond. This amazing hotel offers complimentary shuttle service to and from Madison’s Dane County Regional Airport. Onsite parking is available. Madison offers over 200 miles of walking trails, free weekly concerts, a funky restaurant scene, interesting cultural events, and vibrant farmers' market. There is a strong interest in gardening, herbs, permaculture, and living a healthy lifestyle. This youthful city will more than satisfy our insatiable quest for interesting plant knowledge and garden experiences. Mark your calendars and start your research of this fascinating area by visiting the following links. The Dane County Regional Airport (airport code MSN) is located minutes from downtown Madison and offers more than 95 daily arrivals and departures. The Park Hotel offers complimentary shuttle service to and from the airport. As you approach the city, follow Highway 30 into Madison. Take the "State Capitol" exit off of Highway 30 and you will then be on East Washington Avenue, which leads directly to the Capitol Square. Take the appropriate exit to Highway 151 going north toward the State Capitol. In Madison, Highway 151 will become South Park Street. Follow Park Street to its conclusion to reach UW-Madison. Or, from Park, take a right onto Johnson Street to reach the State Street/Capitol Square area. Take the Hwy 12/18 (Beltline) exit to Madison. If you are going to the Alliant Energy Center or Monona Terrace, exit at John Nolen Drive. If you are going to UW-Madison, exit at Park Street and follow north. Ms. Belsinger is a culinary herbalist, educator, food writer, and photographer whose articles and photographs have been published in The Herb Companion, The Herbarist, The Herb Quarterly, and numerous other publications. She has co-authored several best-selling, award-winning cookbooks. The Culinary Herbal: Growing & Preserving 97 Flavorful Herbs is her most recent book co-authored with Dr. Arthur O. Tucker, published by Timber Press, January 2016. Susan has appeared on Good Morning America, CBS Morning News, P. Allen Smith’s Garden Home, and made many other TV appearances both nationally and on local cable stations. Susan has boundless enthusiasm for the herb world. She loves growing plants, being outdoors in the garden, walking in the woods, foraging for herbs, and herborizing with like-minded folks. Besides gardening organically and teaching, Susan travels throughout the U.S., Canada, and Europe giving lectures and demonstrations. You can regularly find Susan at Taunton Press’s www.vegetablegardener.com where she has been blogging for more than eight years. She is a weekly contributor and you can take advantage of hundreds of her articles and recipes. A life-long lover of all aspects of gardening and nature, Debbie Boutelier’s interest in herbs and other edibles began in the early 1980s when she planted her first edible garden with vegetables and culinary herbs. Her interest rapidly grew into a vocation spanning the many different aspects of using herbs in everyday life and incorporating organic techniques in all that she grows. After moving to Alabama in 1994, Debbie pursued her interest in herbs and gardening on a full-time basis. Debbie took the Alabama Master Gardener course in 1995 and more recently received the Advanced Master Gardener designation. Her involvement with the Master Gardener program led her into a new career as a County Extension Agent in Autauga County for eight years. Debbie now teaches nationally and presents seminars and workshops on the many aspects of herbs, organic gardening, nutrition, and other garden related topics. She studied the medicinal uses of herbs for over 15 years and completed a three year intensive study at the Appalachian Center for Natural Health. Debbie is a long-time member and past president of The Herb Society of America. She has appeared on “The Time of Your Life” (local NBC affiliate) and on Troy Public Radio. Jane Hawley Stevens (University of Wisconsin, Madison, BS in horticulture, 1981) has been working with herbs, from starting seeds to creating herbal wellness, since 1981. Jane’s business, Four Elements Organic Herbals, began in 1987 in the pursuit of a dream to establish a family farm and continue her horticultural career while raising a family. Four Elements Organic Herbals is located in Baraboo Bluffs, Wisconsin, on Jane and her husband David’s 130 acre certified organic farm which is composed of cultivated fields, prairie, and woodland. They started out supplying stores with organically grown potted herbs and have developed an extensive herb collection. Herbs became a way of life covering cooking, crafts, body care, and overall support. Jane believes that healing comes from nature, so dedicates her energy to nurturing healing herbs, both cultivated and wild. The herbs are hand harvested at peak potency to create her unique line of remedies. In this rural setting, Jane has contributed her message of honoring nature to schools, civic groups, and through Four Element Organic Herbal’s annual open house over the past 31 years. Pat is a home economist (Ryerson University, Toronto, Canada, BAA in Food-Nutrition) and has been a student of herbal wisdom for four decades. In the late 1980s, she led wild herb walks and gave workshops on preparing simple herbal medicines from her home in rural Grey County, Ontario, Canada. Since that time, Crocker has written 22 herb/healthy cooking books, including The Healing Herbs Cookbook, The Juicing Bible, and most recently, The Herbalist’s Kitchen: Cooking and Healing with Herbs (2018). Most recently she has co-authored Healing Cannabis Edibles with Ellen Novack. Pat has 1.4 million books in print. Pat is a lively speaker and demonstrates recipes from her books at food and herb conferences including the International Herb Association annual meetings as well as presenting food demonstrations on timely topics to The Herb Society of America and the Whole Life Expo held in Toronto. Jeff Epping has been Director of Horticulture at Olbrich Botanical Gardens for over twenty years and owner of Jeff Epping Design & Consulting. He oversees the horticultural operations and garden designs of over ten inspirational display gardens, showcasing the best plants for south central Wisconsin. Epping and his staff practiced and preached sustainable gardening for years, which is reflected in their award winning garden designs and environmentally conscious cultural practices. Their designs put plants at the forefront to create gardens that celebrate the region, enhance the senses, and satisfy our innate desire to connect with the natural world. Carrie Hennessy, Johnson Nursery, Inc.
Carrie Hennessey is a horticulturist and landscape designer in the Milwaukee area. She received her degree in horticulture from University of Wisconsin - River Falls with a minor in art. Carrie never knew that her love for plants could evolve into a fulfilling career. Her work experience over the last 20 years began in botanical gardens (including Olbrich Botanical Gardens in Madison and the Paine Art Center and Gardens in Oshkosh) where she was first inspired to teach the public about plants. Carrie recently celebrated her ten year anniversary with Johnson’s Nursery, Inc in Menomonee Falls, WI as a landscape designer. Besides her sales duties, the company’s owner encourages her desire and ability to give presentations to various garden clubs, nature centers, and organizations (such as the Wild Ones and Master Gardeners), on topics ranging from creating butterfly gardens, Wisconsin native plants, to deer resistant landscapes. The Spice House was founded in 1957 in Milwaukee by Ruth and Bill Penzey, Sr. Daughter Patty and son-in-law Tom bought the business from Patty’s parents 26 years ago. Chefs and food writers throughout the country have come to know their reputation for quality, and mentions of their shops often appear in both articles and cookbooks. In 2013 Food and Wine magazine honored The Spice House by including them in their list of World’s Best Spice Shops. They have been featured on many television food programs and hosted Alton Brown and the one and only Julia Child in their shops. They regularly speak at several culinary colleges and for the Culinary Historians of Chicago. As well they have served on the national circuit as lecturers for The American Institute of Wine and Food. The Erd’s were awarded the Chicago Tribune’s award for excellence by the Good Eating section. They have been written up in Gourmet magazine as one of the “must see” stops for those visiting Chicago and have taped three shows as guests on National Public Radio’s “All Things Considered” with Michele Norris. Patty was filmed as the spice expert for a PBS segment based on the magazine Real Simple. If you care to learn more about spices then listen to the recent podcast that Patty and Tom recorded with Alton Brown on the Nerdist site. Kate McFeeley has been a nonprofit accountant in the Madison area for 18 years. Her avocation has been identifying and growing native plants. This interest expanded to include the history and medicinal qualities of these plants. 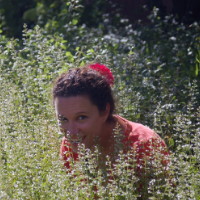 In 2005 Kate started a business called Prairie Pearls which specializes in growing medicinal herbs and native plants. Kate is a member of the Southern Wisconsin Chapter of the American Herbalist Guild, Herbalists Without Borders, and United Plants Savers. She has been a speaker at Olbrich Botanical Gardens, The Nature Conservancy, WORT FM radio, and various herbal meetings. Kate is the founder and coordinator of the Madison Area Permaculture Guild established in 2008. For the last seven years Kate has been teaching permaculture and growing herbs at Madison College including a class titled, “Herb Growing.” Additionally, Kate teaches a course at Edgewood College called “Engaging Emergence.” Kate has taught and presented extensively over the years for garden groups, master gardeners, the local Herb Society, sustainability conferences, and more. For over 10 years she has co-taught the Permaculture Design Certification Course and has graduated over 180 students. In her free time she has volunteered, including serving on the advisory board for Social Innovation and Sustainability Leadership Program at Edgewood College as well as other local and regional boards. Ben is passionate for connecting people to plants and one another through public gardens. With a background in landscape architecture and sustainability studies from Purdue University, West Lafayette, Indiana and Indiana University, South Bend, Ben directs the operations of the garden and its programs. Ben comes to the Allen Centennial Garden from Fernwood Botanical Garden and Nature Preserve in Niles, Michigan, where he started as a horticulturist and eventually became their manager of horticulture. Ben Futa is revitalizing the Allen Centennial Garden with a newly established year-round internship program offering students hands-on experience in the areas of public garden leadership, education and community programming, marketing and outreach, and plant records management. Another new program is Tai Chi in the Garden, offered in partnership with the Tai Chi Center of Madison. All these efforts are intended to preserve and enhance the Allen Centennial Garden’s welcoming environment as the campus’ artful living laboratory. Award-winning writer and author Jeanette Hurt has penned a dozen different books on food and beverage, including three books about cheese. Her book, The Cheeses of Wisconsin: A Culinary Travel Guide, received a Mark Twain Award for best travel book, and her book, Drink Like a Woman, is critically acclaimed. She just finished her latest book projects, The Joy of Hard Cider and The Wisconsin Cocktail Book. She writes a beverage column for Forbes.com, and she is the cheese correspondent for Milwaukee NPR radio station, WUWM. When she’s not developing recipes, working on pairings or writing books, she can be found walking with her family and their dog along the banks of Lake Michigan in Milwaukee.